Value Added Tax may be defined as an indirect tax imposed on value added, that is, on the difference between the cost of materials purchased by a dealer and the price for which it either resells such materials or makes sale of goods produced using those materials. Value Added Tax, in its abbreviated form, is VAT. VAT is assessed on the increased value of goods at each point in the chain of production and distribution. This VAT chain starts with the first sale of any goods by a dealer inside the State and ends with the last sale of such goods or the goods, which have been obtained by use or consumption of such goods. This last sale may be a sale to an ultimate consumer or a sale which results in export of goods outside the State. Under VAT chain, goods in primary form may be sold to a dealer who may use or consume such goods in the manufacture of goods in intermediary form. Such goods in intermediary form may be sold to another dealer who may use or consume such intermediary goods in manufacture of some other goods. In such cases, the VAT chain starts with the first sale of goods in primary form and ends with last sale of those goods which have been manufactured by use or consumption of goods in intermediary form. Thus, in some cases, VAT chain may be long and in some cases it may be short. In some countries, including Singapore, Australia, New Zealand and Canada, this tax is levied on the sale of goods and services and is known as "goods and services tax" or GST. Methods, mentioned in clauses (a) and (b) above, pose practical difficulty in computation of tax and do not give additional benefits to trade and industry over old system of sales tax. Whereas, Input Tax Credit system of VAT, apart from being simple in its application, yields additional benefits to trade and industry over old system of sales tax. Therefore, most of the countries, which have so far implemented VAT, have adopted Input Tax Credit system of VAT. As the system of VAT requires, for the purpose of realization of tax on sale of goods, amount of tax paid in respect of purchase of goods does not form part of the sale price of goods. Credit, of amount of tax paid in respect of purchase of goods, is allowed by the Government. Thus under VAT, amount of tax, paid by any dealer in respect of purchase of goods at any stage, does not travel with the goods. Under the sales tax system, aggregate, of all amounts paid by all dealers in respect of purchase of goods made by them, always travels with the goods. In this article, we will discuss the role of VAT in the development of trade and industry. Though the subject matter of this article has no relevance for the States which have adopted Input Tax Credit system of VAT, yet, it has got much relevance for the traders, entrepreneurs and consumers of those States which have not implemented the system so far. 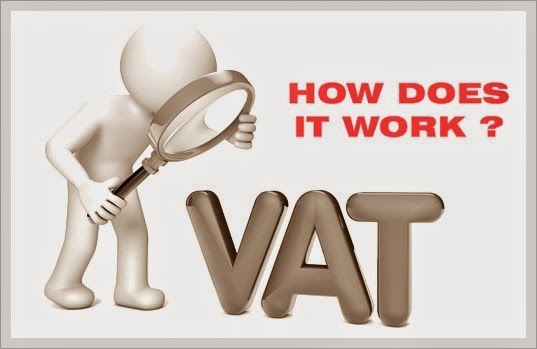 Since VAT is comparatively a new subject for the people of our country, it needs to be explained that how it is implemented and how does it work? Barring few exceptions, the aforesaid equation always gives positive (+) figure of the amount. The dealer makes payment of such amount to the Government. Where the equation gives a negative (-) figure, the dealer receives refund of such negative amount from the Government. In the earlier part of this article, we will concentrate ourselves on the study of VAT chain. As stated above, VAT chain starts with first selling dealer and ends at the point of sale to consumer or where goods are exported outside the State to any other State or country, the chain ends at the point at which goods are exported outside the State. In some cases this chain is long and in some cases it is short. The chain may start with sale of goods in primary form, intermediary form or in manufactured form. The chain does not break when primary goods are utilized either in manufacture of intermediary goods or in manufacture of finished goods and the chain also does not break when intermediary goods are converted in manufactured goods. In the chain, first selling dealer is the person who is not required to pay tax within the State on purchase of his inputs. Therefore, amount of input tax, for such dealer, is zero. (v) E, while making sale of goods purchased by him to consumer, realizes t amount of tax from such consumer. A is first seller of industrial inputs within the State and hence, his input tax will be zero. For this complete VAT chain, amounts of input tax for A, B, C, D and E will be 0, p, q, r and s respectively and amounts of output tax will be p, q, r, s and t respectively. VAT amounts for A, B, C, D and E will come out to be (p-0), (q-p), (r-q), (s-r) and (t-s). They will deposit these amounts into the Government Treasury. Therefore, revenue receipt from all dealers on sale of industrial inputs and manufactured goods will be sum of these amounts, i.e. Tax amount t= sale price of goods sold to consumer x rate of tax/100. (i) If value of t, that is, if the amount of tax realized from consumer is zero then net VAT receipt is zero. (ii) Total VAT revenue receipt is independent of rate of tax applicable on industrial inputs and it depends upon the rate of tax applicable on goods sold to consumer and sale price of such goods at the point of sale to consumer. Thus, where any inputs or intermediary products are used in manufacture of other goods, levy of tax on such industrial inputs or intermediary products gets nullified. (iv) Where the Government grants exemption on manufactured goods, consumer enjoys full exemption from tax burden while, in the system of sales tax, consumer has to bear the burden of tax amount which has been realized on sale of industrial inputs or intermediary products. (v) By reducing or enhancing rate of tax on sale of end product, tax burden on the consumer can be reduced or enhanced. (vi) Sale in the course of the export of the goods can be made completely free from tax burden while in sales tax system, where manufacturer makes second or subsequent purchase of industrial inputs from within the State, exported goods carry burden of tax paid to Government on inputs. Also, in the aforesaid chain, if E, instead of making sale to consumer, makes sale of such goods in the course of export, the exported goods also carry burden of tax paid by C to Government on sale of manufactured goods. (vii) In the VAT chain, at every stage, every purchaser and seller of goods knows that how much amount, as VAT including amount of VAT on inputs used in the manufacture of such goods, has become payable or has been paid to the Government upto that stage. This is not possible in the system of sales tax. (viii) Where goods purchased in a particular tax period are held in stock beyond that period, the dealer claims refund of input tax in the return of that period. Therefore, part of the working capital, which gets blocked in form of sales tax under sales tax system, gets released in VAT. This feature may well be exploited in their favour by dealers who maintain goods in running stocks or who make seasonal purchases of goods and either re-sell such goods during whole year or use such goods in manufacture of other goods in the off season period. (ii) amounts of tax paid by manufacturer of cotton cloth in respect of purchase of cotton yarn and on prorate basis, a part of amount of tax paid in respect of purchase of machinery, lubricants, fuel, etc. Here we see that the Government collects tax through selling dealer of cotton, manufacturers of cotton yarn and manufacturer of cloth from consumer of cotton cloth. In these circumstances, consumer of cloth cannot claim that he is not paying any amount in the name of sales tax. We find that for proving exemption from tax to a consumer of cotton cloth, the Government has to provide exemption on cotton, cotton yarn and machinery, lubricants, fuel, etc. used in the manufacture of cotton yarn and cotton cloth. But all such commodities may also be used in manufacture of other goods or in running of machinery being used for other purposes. Even primary material cotton may be used for several other purposes. Hence, for providing total exemption on cotton cloth it will not be wise to exempt sale of cotton, and other goods which are used or consumed in the manufacture of cotton yarn and cotton cloth. But, under VAT, sale of cotton cloth can be made completely free from burden of tax by providing exemption only on sale of cotton cloth. (i) In the hands of manufacturers, sale price of goods also includes amount of tax paid on purchase of industrial inputs. Therefore, manufacturer, while realizing tax on manufactured goods, also realizes tax on the amount which has been paid as tax on inputs. Under the VAT system of taxation, amount of tax paid by manufacturer on purchase of inputs does not form part of sale price of manufactured goods. Therefore, sale price in the hands of manufacturer under the sales tax system remains higher as compared to sale price of manufactured goods under VAT system. Sale price of manufacturer is the purchase price of the trader. Hence, for purchasing same goods under sales tax system trader needs extra money as compared to money required under the VAT system. This phenomenon is known as cascading effect. (ii) amount of tax will be =Rs.10, 000=00. Therefore, buyer trader, under the system of sales tax, will have to pay Rs.1, 10,000=00. Therefore, buyer trader, under the system of VAT, will have to pay Rs.1, 05,600=00. We see that, under VAT system, buyer trader will have to pay Rs.1, 05,600=00, whereas, under sales tax system, he will have to pay Rs.1, 10,000=00. This establishes that trader will need less amount of capital under VAT system as compared to amount of capital that is needed under sales tax system. (ii) Under sales tax system, generally tax is levied on first sale of goods in the State. Under VAT system, tax is realized at every sale on value addition. Therefore, under VAT, trader need less amount of capital as compared to capital needed under the sales tax system. Example: A, B and C are three dealers within the State and A is the first dealer and makes sale of certain goods to B for Rs. 1,00,000=00. Sale of goods is liable to tax @15%. B, after taking profit of Rs. 20,000=00, makes sale of such goods to retailer C. C, after taking profit of Rs.30,000=00, makes sale of such goods to a consumer. Under VAT, since turnover to be taxed gets increased, therefore, a rate of tax, lower than the rate of tax under the sales tax system, can fetch the same revenue which the State receives under the sales tax system. Let us assume that such rate of tax under VAT is 10%. Now, we can compare gross amount of sales under sales tax and under VAT. Here we see that revenue receipt of the Government, margins of profit of all dealers and consumer s purchase price are not disturbed. But, we notice that under the VAT system, gross purchase prices of B and C are Rs. 1,10,000=00 and Rs. 1,32,000=00 respectively while under the sales tax system the same are Rs.1,15,000=00 and Rs.1,35,000=00 respectively. Therefore, we can safely conclude that under VAT system, with same working capital traders can purchase additional quantity of goods as compared to what quantity of goods they can purchase under the sales tax system. (iii) As stated earlier, under the sales tax system, part of the working capital of traders and manufacturers, both, remains held up in goods held in running stocks. But, under VAT, barring few cases, such capital gets released and is utilized by dealers in increasing their business. This happens because of two reasons. In normal circumstances, rate of tax on manufactured goods remains higher than the rate of tax on inputs and secondly, sale price of goods remains higher than the purchase price. Therefore, in normal circumstances, amount of output tax always exceeds the amount of input tax. Example: Let us assume that sale of electric motors is liable to tax @10% and a trader of electric motors, during a particular year, makes purchase of electric motors for Rupees 30, 00,000=00. He will pay input tax of Rupees 3, 00,000=00. Out of these purchases, he makes sales of electric motors which were purchased for Rupees 26, 00,000=00. If he sells such motors after accepting 20% profit, then his turnover of sale will amount to Rs.31, 20,000=00. Tax amount, realized on turnover of sale, will work out to Rs. 3, 12,000=00. The Trader will claim refund of Rs. 3, 00,000=00 from Government and will pay Rs. 3, 12,000=00 to the Government. The net effect will be that the trader will pay to the Government only Rs.12, 000=00. Electric motors of purchase value of Rs.4, 00,000=00 are left with the dealer in stock at the close of the year. No part of working capital, in the form of input tax, will be held up in stock of Rs.4, 00,000=00. Now, in order to maintain the said stock as running stock, the dealer can regularize his periodical purchases according to his periodical turnover of sales. A dealer who commences a new business makes purchase of goods in bulk. His periodical turnover of sales is much less as compared to huge purchase price of goods. Such dealer claims refund of amount paid as tax on purchase of goods in the first periodical return. Thus, part of his working capital, invested towards tax, gets released and he utilizes such money in increasing his business. Manufacturers, in order to maintain continuity in process of manufacture and supply of finished goods, are required to maintain stock of raw materials, consumable goods, stores and finished goods. Goods in semi finished condition also remain in running stocks. Under the scheme of sales tax, part of the working capital of a manufacturer also gets blocked in form of tax on inputs. But, as in the case of a trader, part of working capital, invested towards tax, of manufacturers also gets released. Next problem under the sales tax system relates to purchases of goods from ancillaries. Let us assume that there are two footwall manufacturing industries. They manufacture identical footwalls. Similar footwalls, manufactured by both industries, will fetch same sale price in the market. We assume that one of the industries does not purchase anything for use in manufacture of footwall while the other industry makes purchase of rubber bladders from rubber bladder manufacturing units. In the circumstances, latter industry which makes purchase of rubber bladders will have to pay input tax in respect of purchase of rubber bladders. Therefore, margin of profit, of the second industry will be less as compared to first unit. Therefore, purchase of rubber bladders will be discouraged. Thus, sales tax discourages the establishment of ancillaries units. If we want that at the cost of sales tax, ancillaries should not be discouraged, we should adopt the system under which amount of tax paid by both manufacturers in respect of purchase of inputs should be refunded to them and both industries should pay tax to the Government on the same amount of sale price. Input Tax Credit system of VAT provides such facility. Therefore, amount of tax paid by consumer comes out Rs.13.64, whereas amount of tax paid to Government by first selling dealer is Rs.10=00 only. i.e. Amount of tax =Rs.13.64. In this situation also, amount of Rs.10=00 has been paid to the Government whereas the consumer has paid Rs.13.64=00 in the name of tax. Important question is that where does this excess amount of Rs. 3.64 go? The answer is certainly not in the pocket of the dealer who makes first sale of goods within the State. Either it is shared in between the second seller and the retailer or it is exclusively possessed by the retailer. In both cases, margin of profit increases and therefore, this excess amount of tax is supposed to have also been shared by Income Tax Department. Under VAT system of tax collection, we have seen that Government receives the same amount which is paid by consumer as tax. Example: Suppose there are three dealers A , B and C. A is manufacturer of goods, B is wholesaler and C is retailer. A makes purchase of inputs from outside the State and hence he does not pay any tax to the State Government in respect of purchase of inputs. A sells certain manufactured goods (taxable @10%) to B for Rs.100=00 and realizes tax amount of to Rs.10=00. B sells such goods to retailer C for Rs.120=00 and realizes tax amount of Rs.12=00. Finally, C sells such goods to consumer at MRP (say Rs.150=00). Then the retailer will realize Rs.13=64 as tax. Here we see that Government receives the same amount of tax which is paid by the consumer to the retailer. This happens on account of unique feature of VAT chain. In the VAT chain, at every stage every purchaser and seller of goods knows that how much amount, as VAT including amount of VAT on inputs used in the manufacture of such goods, has become payable or has been paid to the Government upto that stage. This is not possible in the system of sales tax. Another feature of VAT system is that, as a result of rise or fall in selling price of goods held in stock, VAT does not effect the profit or loss whereas in the system of sales tax, rise in price of goods held in stock, tax earns additional profit and in case of fall in price of goods held in stock, tax gives additional loss. (viii) bringing the transparency in payment and realization of tax at level of all selling dealers. Here I would like to point out that, in manufacturing States, implementation of VAT has also abolished levy of tax on inputs, in case of inter-state sale of goods against Declaration Form C because rate of tax on inter-state sales has not been increased and refund of input tax has also been allowed to manufacturers against inter-state sale of manufactured goods. In the importing State, the fall in sale price should have been reflected and benefit should have been passed on to consumers in the importing State. But I don t think that it has happened. Who has availed the benefit, the manufacturer in the State of manufacture or a trader in the importing State? Implementation of VAT is a long exercise and gives rise to several questions. But this article, itself, has become lengthy one. Otherwise, also, such other questions are outside the scope of the subject matter of this article. But, I will like to point out that reduction in number of tax rate slabs has nothing to do with VAT. Whether VAT is implemented or not, the need of simplification of the existing system, definitely, requires that number of tax rate slabs should be brought down. Second thing which I would like to point out is that VAT is not meant for increasing revenue by increasing tax rates. Long efforts have been made to work out revenue neutral rate. But it did not turn up to be an easy job. As it relates to impact of VAT on prices of goods, it cannot be assured that prices will remain static. Rise or fall in prices will depend upon several factors including factor of increase or decrease in rate of tax. As it relates to agitation by the traders against VAT, I do not think it proper to make any comment. In the last, I would like to tender my apology for having valuable time out of busy schedule of the learned readers. I would also like to share comments of the readers of this article. Comments and suggestions may be sent by post.